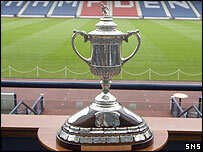 Junior clubs will take part in the Scottish Cup for the first time from next season, the Scottish Football Association has agreed. Four junior clubs will be given places in the first round following a vote at the SFA's annual meeting. The qualifying competitions have been scrapped, with an extra round being added to open up the competition to more non-league clubs. Extra-time and penalties will now decide semi-finals instead of replays. This year's semi-final replay between Dunfermline and Hibernian attracted much criticism and a meagre crowd. SFA president-elect George Peat, who led the working group into the Scottish Cup rules, had said before the meeting that the revamp would give a real boost to the competition. "At the moment, 36 non-league clubs take part in two qualifying cups, with the top eight sides winning a place in the first round of the Scottish Cup," he said. "But, under the new proposals, all these teams will now participate in the first round proper, not only giving them a far better chance of progressing in the competition but also enabling more teams, more players and more football supporters to enjoy this historic competition. "We're also proposing that four junior teams compete in this first round, enlarging the total number of clubs who participate in the Scottish Cup to 82. "One of the most important ingredients of this competition is the 'romance of the cup' and we're confident that these changes will help foster the unique character and enjoyment of the country's foremost knockout competition and will also increase the chance of 'giant-killing' exploits." Clubs had voted down previous attempts to open the competition to junior clubs. But this time they agreed to the plan to allow four junior clubs - the three Super League winners and the Junior Cup winners - into the competition.